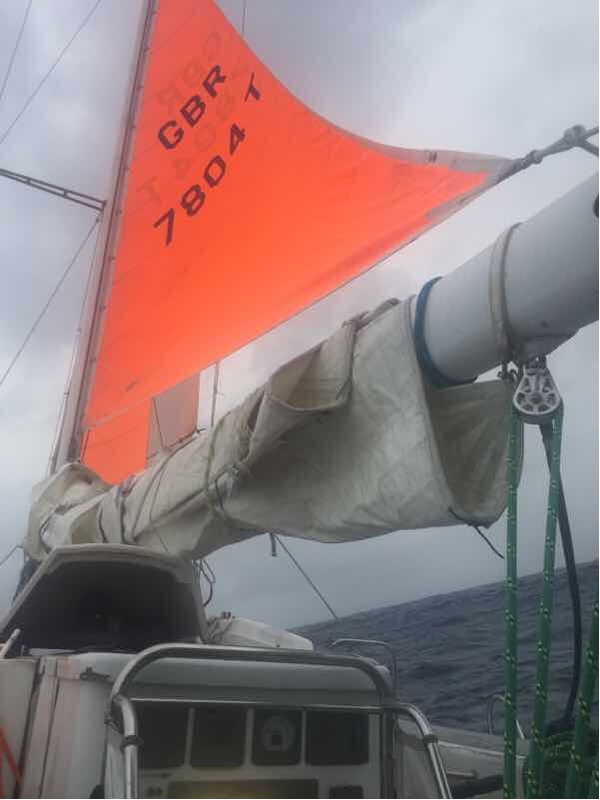 Today we put on the tri-sail to save the main sail and started sailing south east to get out of the worst part of the low pressure system moving in our area. These low pressure systems have kept on coming one after another. For the past few weeks, our weather team has been sending us reports to advice us about those conditions and warn us that I wouldn’t be able to swim. I have been stretching those limits. Plus under those conditions our sailing capacity is limited, we can only use reef two or three on the main sail. Yoav was not confident about the strength of the repair on reef three (we don’t have a reef 2 anymore and reef one needs repair too). And using the tri sail instead of the main sail is using our emergency resource before being in a real emergency situation and that also concerned him. With the tri sail the boat is less maneuverable and her up sail capacities are limited as well. If something goes wrong with the tri sail, then Seeker cannot sail. Then, we could only rely on our motor but we only have 15 days worth of fuel and that wouldn’t be enough to get us to the closest main land. Compromising our safety was concerning Yoav and the rest of the crew.